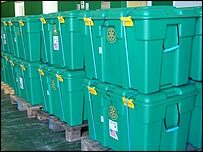 Two volunteers from Cornwall's Shelterbox charity have been sent to America to oversee the distribution of boxes of aid. The Helston-based charity hopes to send 900 boxes to Houston, Texas, by the end of the week to help those affected by Hurricane Katrina. Hundreds of boxes have been sent already, all paid for by American Rotary clubs. Another back-up team for the charity is due to be sent out later in the week. Each American aid box contains two 10-man tents, four blankets, four water carriers and enough water purification tablets for 20 people for six months. Children's activity packs have also been included, containing pencils, crayons and colouring books. Shelterbox Operations Manager George Armstrong said: "We've already sent two people, they're on their way. "They'll go to Houston to make sure the right people get our aid packages. We have a duty of care to our donors to ensure that happens. "The two will assess the situation there and we're readying a back-up to team to join them later this week." The boxes are taken by truck to Gatwick Airport before being flown to the United States.